the breakfast blog: International Gastronome, Moi? In this month's Australian Gourmet Traveller, fellow food-blogger Ed Charles lifts the kimono on the local scene. Like most insider accounts, it's a good read. 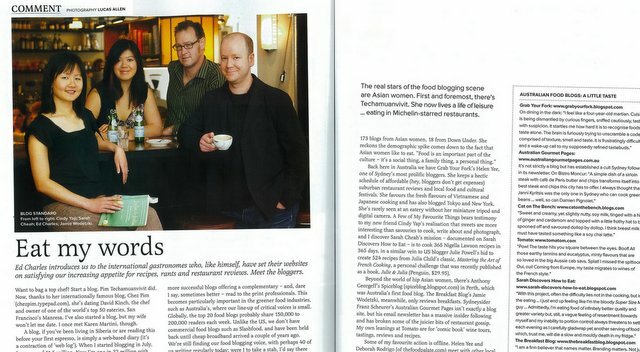 A journalistic menu de degustation of food blogs in Australia and beyond, including the humble breakfast blog. I'm not sure about the international gastronome tag. And I'm not a hip Asian woman. But I am a food blogger. Eat my words. No, Cin, you were right. The magazine was wrong. The essay writing service we provide is based on a quality, unique groundbreaking research, and timely delivery! Well, looks like reading your article could be fun!